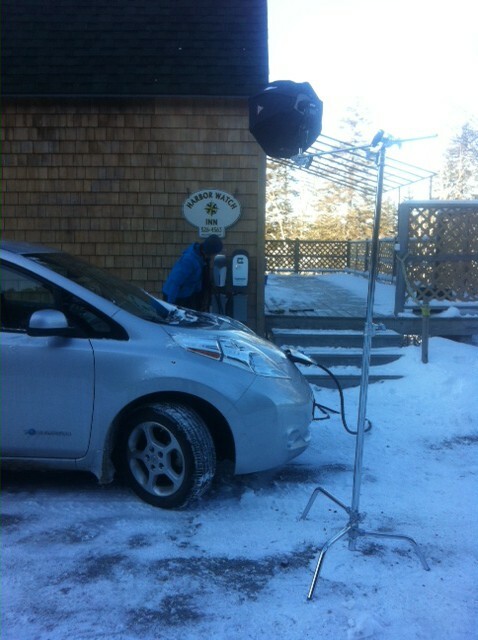 I picked one of the coldest days of the year to travel out to Swans Island to photograph my friend Colleen's new Tesla charging station at her Harbor Watch Inn. We thought it would be fun to take a picture and write a press release to promote electric vehicles and inn. It was fun, but it was damn cold. How cold was it? The thermometer at my house read -2F, but I think it warmed into single positive digits during the shoot. After I got everything set up, but before I put my two models to work, I had to go inside and hold my hands over a radiator for 10 minutes until I could feel my fingers again. This shoot was a race against the clock because after arriving on the ferry, I had just an hour to set up, get the shot, pack up, and be in line for the return ferry which I had to catch to be back to Southwest Harbor in time for an appointment. The night before I had consulted The Photographer's Ephemeris to know where the sun would be, but didn't consider the trees that would be blocking it's rays. When I arrived at the inn, the scene was in a dark early-morning shadow as you can see in this photo Colleen took while I was setting up. Fortunately I brought my own light and quickly set up a Canon 600EX-RT flash enclosed in a Photoflex Octodome mounted on an Avenger C-stand. The C-stand is a beast – bulky, heavy, ice cold metal – but I'm glad I brought it. It's weight and sure footing held it steady on the ice and let me extend the soft box over the car onto Janice and Colleen. All that light on the women and the sign is coming from that one little flash. I shot with a Canon 5D Mark III DSLR, Canon 24-70mm lens, and a Canon ST-E3-RT transmitter to fire the flash. I kept expecting the flash batteries to die, but they held up, as did my two models who seem to be enjoying their 15 minutes of fame. You can see the black & white version of the image here. Below the photo is a draft of the press release. Done reading? Now go out, buy yourself a Tesla, and book a room at the inn for next summer! Swans Island, Maine — The Harbor Watch Inn on Swans Island has partnered with Tesla Motors by joining the Tesla Destination Charging network. Designed to incentivize thought leaders in the hospitality industry, Tesla offers this program to early adopters who wish to attract forward thinking and passionate customers. 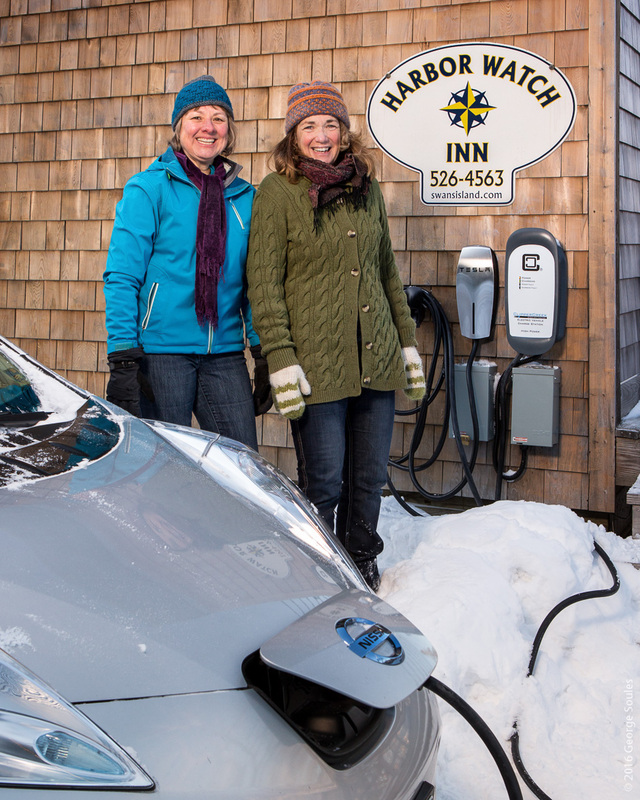 Harbor Watch Inn proprietor Colleen Hyland wanted to offer convenient charging for electric vehicle (EV) owners staying at the inn and Tesla accommodated her by providing a Tesla Wall Connector as well as a 240V universal charging station for other makes of EVs. Swans Island lies off shore from Mount Desert Island and Acadia National Park. Access by car is from Bass Harbor via a six mile ride on the Maine State Ferry “Captain Henry Lee” which holds 17 vehicles as well as walk-on passengers. In the summer, the island’s year-round population of about 330 people swells to over 1,000 and that’s when Hyland hopes to see EV owners staying at her inn. EV proponents tout that EVs emit no greenhouse gasses like carbon dioxide that contribute to global warming, but also point out that an EV is only as green as the source of its electricity. Electricity in Maine comes from relatively green sources compared to other states that produce electricity using dirty coal-fired power plants that produce smog-forming pollutants. The U.S Energy Information Administration reports that in 2014, three-fifths of Maine’s net electricity generation came from renewable energy resources, with about 25% from hydroelectricity, 27% from biomass (mainly wood products), and 8% from wind. Early adopters like Hyland and Kenyon, combined with the vision of company’s like Tesla Motors, are together making a difference by actively taking the steps necessary to transition toward a cleaner, healthier planet.